Yosemite National Park is one of the oldest and most famous parks in America. It offers the public an incredible access to a wide array of plant and animal species and provides some of the most scenic vistas around. Travel Radio International, with J. D. Streeter and Patricia L. Lawrence, have put together an invaluable program that gives listeners an in-depth look at this national treasure. Traveling by tram, and with the assistance of a knowledgeable park guide, Patricia and J. D. explore all of the wealth of Yosemite, including discussions on the bird population, native wildflowers, and it’s rich history of Native Americans. 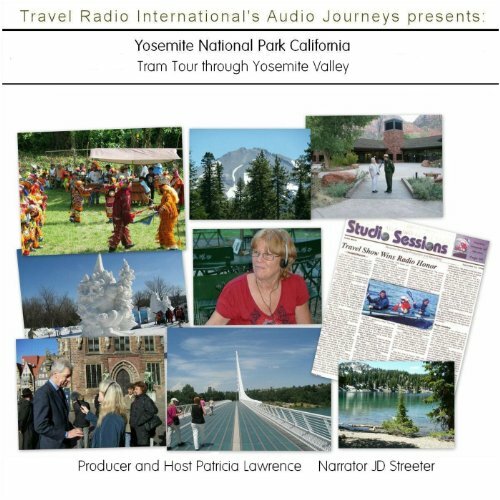 Audio Journeys explore Yosemite National Park, California via a tram. Spring is a great time to visit Yosemite, when birds and wildflowers flowers abound. Our tour guide tells us about rock climbers, Miwok natives, the swift flowing Merced River, and other superlatives of Yosemite. One of the oldest parks in the nation, Yosemite was made a national park in 1890, and designated a World Heritage Site in 1984.